Warning, this post contains spoilers for the film Guardians of the Galaxy Vol. 2. Proceed with caution. For longtime fans of Marvel Comics, one of the biggest treats in Guardians of the Galaxy Vol. 2was seeing the original Guardians of the Galaxy debut on the big screen. 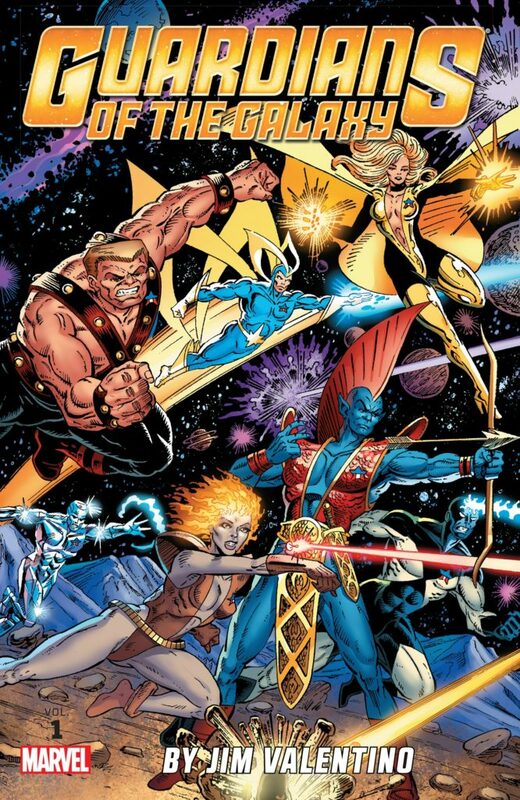 Led by Sylvester Stallone in the role of Stakar Ogord, also known as Starhawk, the OG Guardians were re-positioned as Ravagers, much like their former teammate Yondu (the always amazing Michael Rooker). Created in 1969 by writer Arnold Drake and artist Gene Colan, Guardians of the Galaxy bounced around the year 3000, traveling back and forth in time and battling all sorts of villainous aliens. It was basically a generic superhero comic with a semi-rotating cast until the 1990s and a man named Jim Valentino–the very same who helped found Image Comics. With a fresh new #1 issue, Guardians of the Galaxy relaunched with Valentino serving as writer and artist. Under his creative direction, the adventures of Starhawk, Aleta, Charlie-27, Yondu, Martinex, and Nikki got weird. Really weird and really awesome. Does the inclusion of these characters mean that Marvel plans on showcasing some of their bizarre adventures? It’s certainly possible. With the current slate of Guardians of the Galaxy films, Marvel Studios has proven they ain’t afraid of getting weird, and that’s a good thing. If they plan on exploring the adventures of the original Guardians, things are going to get even weirder. We encourage you to visit your favorite comic book store and pick up some of the classic Guardians of the Galaxy collections, but in the meantime, we thought we’d share some of our favorite moments from the awesomely crazy ’90s run of the series. The real star of the Guardians of the Galaxy Vol. 2 is Taserface, the mutineer Ravager who wages battle upon Yondu. You could be thinking, in the comics, Taserface was a Stark: a race of aliens who worshiped Tony Stark. These folks loved Iron Man so much they named their entire race after him. Unlike his cinematic counterpart, the Taserface of the comics is named as such because he literally shoots a taser beam out of his facial armor–it’s not metaphorical, in other words. The Guardians find themselves on Earth on a number of different occasions, but the strangest involves a trip to Manhattan and a battle with the Punishers. New York has all but been taken over by this brutal gang of Frank Castle devotees. The Guardians engage in an epic street war with these goons and it basically ends with the Guardians retreating. The Punishers are too vast and too insane. In the world of the original Guardians of the Galaxy, mutantkind fled Earth and started a new life on a different planet. The series actually lays out a pretty cool backstory for this, but the strangest footnote is that the descendants of Wolverine essentially take over as supreme rulers of all mutants. When the Guardians cross paths with the mutants, they are lead by Rancor. She’s a tyrant who looks exactly like Wolverine – that haircut ain’t a good look, lady – and murders her own father. She then takes over the whole planet and turns all the humans she can find into slaves for mutants. It’s crazy stuff. The one character that seems to be missing from the lineup of original Guardians in Guardians of the Galaxy Vol. 2 is Vance Astro. The former astronaut is a time traveler, of sorts. He was in a hypersleep on a ship that veered off course, leaving him in suspended animation for over a thousand years. The Guardians discover him, and he joins up with them, eventually becoming the group’s leader and moral center. He ends up with Captain America’s shield, like the original Captain America, and wields it with telekinetic powers that he gained, uh, somehow. All in all, he’s actually a pretty cool character with a great design, that is, until he is reborn as Major Victory. Yes, Major Victory, the most 90’s superhero ever. Even in the far reaches of outer space, in the distant future, mullets and headbands became fashionable. Just look at this guy! The sleeves trenchcoat, the collar, the thigh-high boots! In a comic series filled with crazy stuff, this just might be the craziest. Major Victory, we salute you and your weird fashion choice. There are plenty of other bizarre moments in the 62-issue run of the 1990s Guardians of the Galaxy. Sure, most of them won’t make it into any Marvel movies, but some might. Hey, 20 years ago, who would have thought we’d have a big screen version of Rocket Raccoon? Maybe Major Victory is ready for his close-up? I mean, Taserface got his screen time, right? Give Vance Astro his due, Marvel! Did you read the old-school Guardians of the Galaxy? If you did, sound off in the comments below and let us know your favorite moment from the series!